DIRIS products are high quality OEM-Components for integration into high-end video and audio equipment as well as appropriate installations. Behind the DIRIS products is a unique product- and technology concept. Thanks to this well thought-out concept DIRIS products can be flexibly adjusted to the specific requirements of your application field. Development and production takes place in Germany at the Technology Park Berlin-Adlershof, thus allowing short distances and direct communication. Various elements of the DIRIS OEM product concept will be documented on the following pages. Delay < 40 ms at live display with recording and synchronous operation of several systems. Ein sofort-lauffähiges Evaluation-Kit ermöglicht schnelles Testen, Anwenden und Integrieren von DIRIS-Produkten. 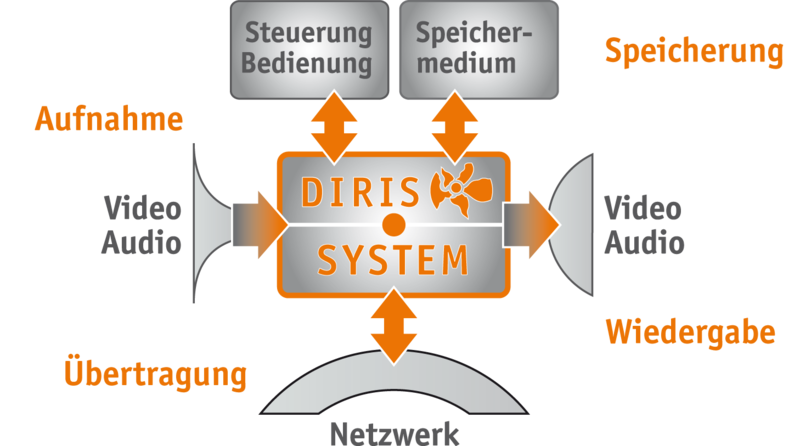 DIRIS products are manufactured with selected suppliers and partners in Germany. Every single unit is tested with an individual test protocol (semi-) automatically reproducible. Transparent and reliable business conditions secure lasting and trustful cooperation between X-SPEX and DIRIS our OEM customers. Die DIRIS technology provides the optimum connection between a mature standard product (with all the benefits that standardization offers) and the fulfillment of individual requirements. DIRIS products are made according to customer requirements in the proper mechanics as compact modules, flexible boards or complete boxes and delivered in series. From simple (and inexpensive) display-only systems to complex products with live image processing. Matching price / performance ratio for different requirements. Practically all common source and output media, including CMOS sensor, display panel and audio with digital amplifier. Mass storage devices for different needs either on-board integrated into or connected externally and changeable. can be operated locally (button or touch screen), controlled by a nearby microcontroller via UART, or controlled from any Network interface remotely. Streaming and control from remote systems via USB, Ethernet, Wi-Fi and UMTS. In the simplest case the power supply is regulated by a reliable regulated power supply unit. If necessary, it can also meet automotive requirements, include a charging function for battery operation or responds to a spontaneous power-OFF of a super capacitor buffering. DIRIS products need very little power, are particularly long for use and require minimal material resources due to the compact design.